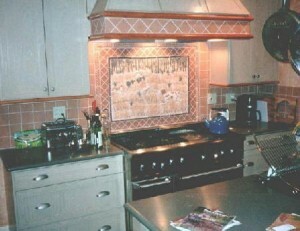 This wonderful backsplash was created for the proud owner of French Brittany Spaniels. Pictures of his dogs and acreage were used in designing this piece. The use of rope moldings, bullet moldings and different sized field tiles really creates a beautiful effect.